Whatâ€™s the hot trend in gardening this season? Cool, clean water gardens. You donâ€™t have to excavate a pond, or even have a yard to enjoy the soothing sounds and sites of a water garden. Our water garden in a tub can easily fit on any deck or patioâ€”you can even place it indoors! You can take a dip into water gardening with this easy-to-assemble project! potting a water lily in 3 easy steps! Place the water lily in a Planting Containers filled with soil (don’t use potting soil, because it is too light). 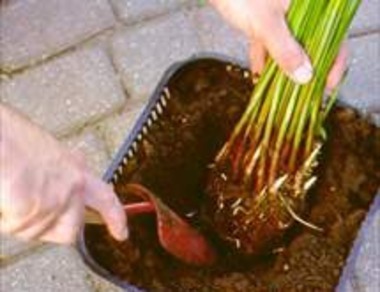 Spread the roots in the planting hole and cover with additional soil. Add a layer of gravel to keep the soil from washing out of the basket and muddying the water of your tub garden. 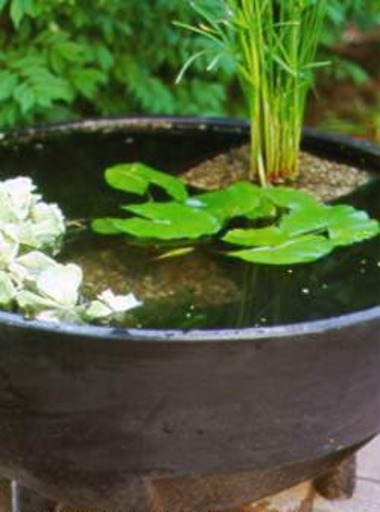 Set the potted water lily on the bottom of the tub garden so it sits 8 to 10 inches under water. Soften the edge of your water garden, by adding a few marginals. These plants, whose roots are in a pot of soil, sit on the ledge of your tub garden, or along the edge of any pond. Gravel on top of the soil keeps it in place. The cattail, pictured at right, offers height, attractive spiky foliage, and cute velvety cattails. Click here to see a list of hardy and tropical marginals. 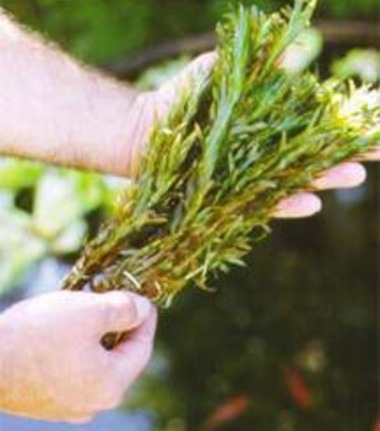 A healthy water garden has many different types of plants, each with an important function. Oxygenating plants, such as anacharis, offer shelter for small or baby fish as well as help control algae growth (so your pond doesn’t turn into a green, slimy mess).